IS COMING TO FAIRFAX, OCTOBER 22-27! Enter a fantastical winter wonderland beyond all imagination at Disney On Ice presents Frozen! The heartwarming, Academy Award-winning tale you love is now LIVE and skating into your town. You’ll be magically whisked away into the wintery world of Arendelle, where you will be dazzled by amazing special effects and astonishing skating. Sing and dance along to your favorite songs, including “Do You Want to Build a Snowman” and “Let It Go.” Join royal sisters Elsa and Anna, the hilarious snowman Olaf, huntsman Kristoff, his loyal reindeer Sven and the mystical trolls as they journey to discover that true love is ultimately the most magical power of all! 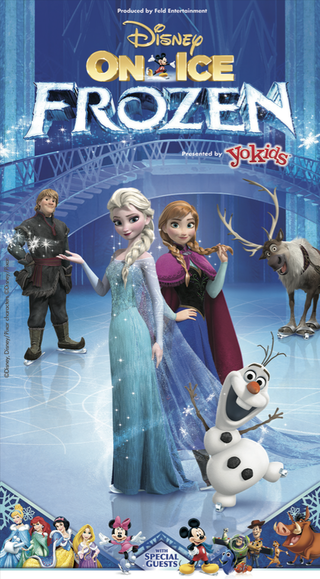 Produced by Feld Entertainment, Disney On Ice presents Frozen! will also feature guest appearances by the beloved Disney Princesses as well as characters from The Lion King, Toy Story and Finding Nemo. Disney On Ice presents Frozen! will be at the Patriot Center from October 22 – 27. · Wednesday. October 22 | 7:00 p.m.
· Thursday. October 23 | 7:00 p.m.
· Friday. October 24 | 10:30 a.m. & 7:30 p.m.
· Saturday. October 25 | 10:30 a.m., 2:30 p.m. & 6:30 p.m.
· Sunday. October 26 | 10:30 a.m., 2:30 p.m. & 6:30 p.m.
· Monday. October 27 | 7:00 p.m.
To discover more about Disney On Ice, go to www.disneyonice.com, or visit them on Facebook and YouTube. me with complimentary tickets to Feld shows and opportunities to attend private Feld pre-Show events. Even though I receive these benefits, I always give an opinion that is 100% mine.